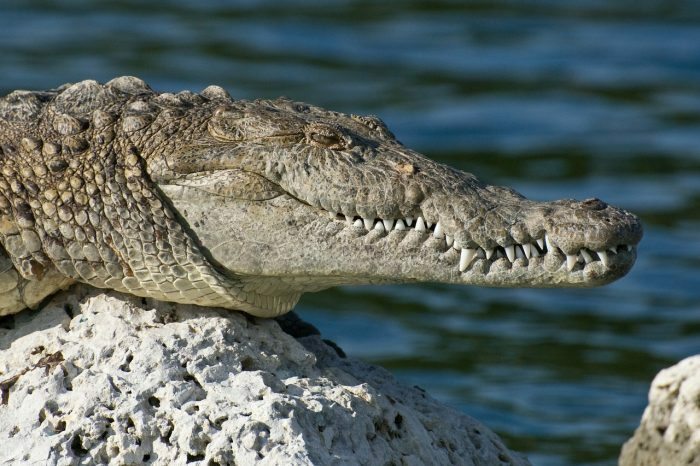 Predators of the crocodile vary depending on the region where they live; young crocodiles can be prey for black kites, turtles and large predatory fish, while full grown crocodiles’ biggest threat are humans who eat and hunt them. Lizards prey upon the nests of unhatched crocodiles. Only 2 percent of crocodiles survive predators to become fully grown. Crocodiles are skilled predators and good swimmers. A crocodile can move at about 18 miles per hour on both land and water. Humans are the most threatening predator to adult crocodiles. Not only do humans hunt them for their meat, but they also use crocodile hides to make belts, purses and boots.